The 10th Judicial District Commission on Judicial Performance unanimously recommends that Judge William David Alexander BE RETAINED. Judge Alexander was appointed to the Pueblo County District Court bench in April, 2012. Judge Alexander served as Municipal Court Judge for the City of Pueblo for approximately ten years prior to his appointment. His experience also includes service as a Deputy State Public Defender and Magistrate for the 10th Judicial District. 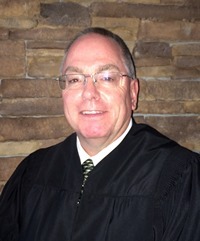 Judge Alexander received his undergraduate degree from Columbia College in 1986 and his law degree from the University of Denver College Of Law in 1990. Judge Alexander currently handles a criminal docket, which includes a relatively new Behavioral Health Court, and a mental health docket, which has him conducting hearings weekly on the Colorado Mental Health Institute Pueblo’s (State Hospital) campus. Judge Alexander is regarded by those appearing before him as congenial, calm, affable, professional, respectful and patient. He is willing to listen to parties and makes fair and balanced decisions and is consistent in his sentencing. He recognizes the need for improvement in the areas of timeliness and inconsistencies of legal rulings, particularly in complex cases. He manages his docket well and runs an efficient courtroom. Judge Alexander brings genuine enthusiasm to his work and enjoys the challenges that are inherent in his job.